Macrimination is bad when practiced by those on the outside, but it can be even worse when it’s an inside job. I know discourse and debate are centerpieces of open and democratic societies — that’s why I write this column. But I was flabbergasted this month when I opened the May issue of Macworld magazine and read the letters from readers. Many of the comments referred to a cover story the magazine did in February called "Exterminate OS X Troubles." I had read the piece and didn’t think anything of it. There were some good troubleshooting tips, but nothing I hadn’t seen or read before. Good information for new OS X users to have, I thought. Apparently, to OS 9 users, it was another chance to bash OS X. "Unbelievable. Virtually en entire magazine devoted to fixing OS X bugs. Face it — OS X isn’t really Mac-like at all, and until Apple twists that aberration into looking and acting like a Mac, it will remain dead in the water," one reader wrote. I was saddened, but not surprised, to see such comments. 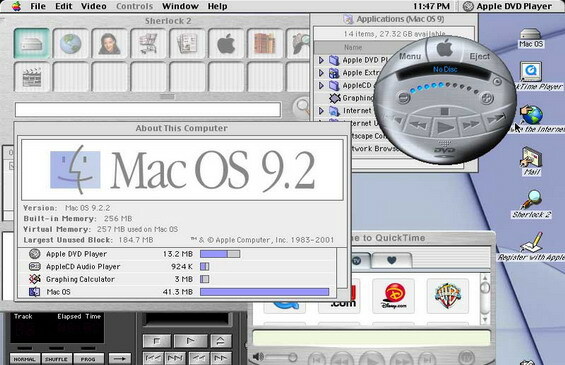 It’s been more than two years since Apple first released Mac OS X. Admittedly, when Cupertino first unleashed the operating system, it was more of a scruffy, ferile cat than the nimble Jaguar it is today, or the ferocious Panther it will become tomorrow. Things have changed quite a bit since March 2000. I’m not going to use this article to bash anyone who still uses OS 9 — there are still plenty of computers getting good use that are too old, or too slow, to run OS X. But what I am going to do is to try and give them a small glimpse into the world they are missing. The weather is beautiful and sunny here, people, and the humidity is just right. I can’t remember the last time I had to reboot my machine for anything other than a software update. Here’s why it’s so great. 2. .Mac/iCal/iSync — Parts of .Mac — such as its e-mail service, Virex anti-virus program, and iDisk — all work in OS 9. But some of the coolest features available to .Mac members are not available there. Here is a real world example of something that might happen to me. I get an e-mail from a friend — we’re going to meet at 9 p.m. at a restaurant. Immediately, I go to the iCal To Do Konfabulator widget, which sits integrated into my desktop. It uses AppleScript to talk to iCal, and displays a list of to-do items in my workspace. If I click on the add an item button, I can enter something in the resulting dialog box, and it’s automatically entered into iCal. Before I leave for work, after I’ve downloaded the latest "All Things Considered" National Public Radio program from Audible, I plug in my iPod to sync it. It picks up the radio show, and also my iCal database using iSync. At the end of my shift, I check to make sure I’ve done everything. Oh yeah, I think. Dinner with Matty. But what’s his number again? It’s also right there on my iPod, synced up from Address Book using iSync. Even if you don’t have an iPod (I don’t know how anyone can live without one, though), you can use .Mac and iSync to sync up your Address Book and publish your iCal calendars and get them via the Web at work. This scenario, as described, cannot happen in OS 9. 3. Safari — Apple’s own browser has reached its second beta and is just about completely ready for prime-time. Not only is its speed amazing, but its rendering engine, which will be a part of the OS, promises to bring new possibilities to developers looking to write Internet-enabled applications. The second beta also adds another feature I cannot live without now — tabbed browsing. The feature is available in Netscape for OS 9, but not in Internet Explorer. Its bookmark organization scheme is the best on any platform. The complete user experience of Safari shows that Apple is serious about continuing to be a player in the software business, which could very well be its future. And it makes it a lot of fun to surf, too. 4.NetNewsWire Lite — This program will change the way you get your news from the Internet. No longer do you have to keep a cumbersome list of bookmarks that you visit everyday, waiting for the page and all of its advertisements and links to load. Most sites also now offer what is called an RSS feed, sets of quick-hit headlines and blurbs for their top stories. NetNewsWire Lite allows you to read these right inside the program, and only head to the site to read the rest of the story if it suits your interest. Feeds are set up as subscriptions, with a whole host of news/Mac/tech sites available after you first start the program, and good directions on adding your own feeds that you scrape from the Internet. 5. Watson/Sherlock — Watson — and its Apple-made clone, Sherlock 3, also will change the way you get information from the Internet. Using Web services, Watson will help you keep track of eBay auctions, check on FedEx shipments, look up Zip codes and telephone area codes and check on movie listings (complete with the film’s preview loaded in QuickTime right inside of the program). Sherlock 3 does many of these things, too, and offers the additional benefit of having an easy-to-decipher standard for folks to add their own channels. As a result, there are plenty of third-party Sherlock 3 channels for everything from looking up music lyrics to finding tablature music for guitar. 6. UNIX — To some OS 9 users, this may not seem like a benefit, having a complex, command-line-based operating system under the hood. But for some of you Web developers sitting on the OS fence, note that with OS X, you can run PHP and MySQL right on your own machine to help you check your work. As a matter of fact, Apache is the engine that runs the new Web-sharing engine for Mac OS. It’s as simple as clicking "start" in a preference pane. Try that in OS 9. Also, some great Mac OS X programs have their roots in UNIX and were ported over, such as Video Lan Client, which is pretty much the only Mac video client I have ever used that has consistently been able to handle any PC video codec I’ve thrown at it. QuickTime always seems to choke on many of those same movies, no matter how many codecs you might download from VersionTracker. 7. Rendezvous — From Apple’s description: "Rendezvous lets you create an instant network of computers and smart devices just by getting them connected to each other. Rendezvous The computers and devices take over from there, automatically broadcasting and discovering what services each is offering for the use of others. The network could be as simple as two AirPort-equipped PowerBook users sitting in a hotel meeting room miles from the nearest AirPort base station with some large files they need to share. Before Rendezvous, frustration. With Rendezvous, your computer will discover others, making file sharing completely simple." Enough said. 8. EyeTV — Another gadget I’m not sure how I lived without. EyeTV is a USB-connected peripheral that essentially turns your Mac into a TiVo personal video recorder. It connects to your cable or satellite signal and converts the signal to video before sending it across USB to your hard drive. The interface is amazingly simple and elegant, and it’s integrated with Watson. You can surf your TV listings in Watson and click a little eye icon to have a program automatically recorded by EyeTV. I have one of the strangest work schedules I’ve ever heard of, but now I don’t have to miss "The Dead Zone" on USA every week. Shows you like can be exported to Toast for burning as Video CDs, too. 9. Hey, this site wouldn’t be around without OS X, would it? 10. The OS X Developer Tools — This is by far the coolest part of OSX for geeks. I can think of no other OS that gives away so many useful things for free. Programs like Project Builder and Interface Builder, and extensive documentation deposited right onto your hard drive, open the world of Cocoa and object-oriented programming up to anyone who has bought OS X and wants to dive in. Other programs, such as Package Maker and Icon Composer, give you all of the tools you need to make high-quality Mac OS X programs without shelling out hundreds — or even thousands — of dollars on a development software package. But hey, if you’d rather experience a system freeze every couple of days and keep on playing with your extension sets, by all means, don’t let me stop you. Tune in next week, when I might look at Apple playing around in the wonderful world of music with its as-of-yet unannounced music service and reported overtures to buy Universal’s music division.